Outdoor garden and PVC and lightweight goalposts are portable and durable. 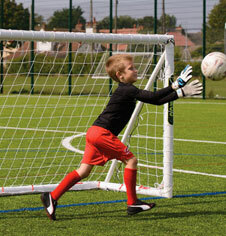 Available in a large choice of sizes the mini goals are suitable for all ages and abilities. Moulded PVC with locking corner options make the goals ideal for garden use. Mini target training goals for soccer practice. 8ft garden training goalposts for junior players and 16ft goals for 7v7 and 9v9 games. Lightweight and compact folding models allow transport and convenient storage. Price per single goal. Single multi sized PVC pop up freestanding play goals. Single locking joint PVC freestanding match goals. Freestanding 2.44m x 1.22m Pro Shot PVC play goals. Polygoal 3.66m x 1.83m PVC plastic freestanding goals. Panther 1.5m x 0.9m mini garden target training goal. Aluminium 1.55m x 1m mini freestanding folding goal. Aluminium 3.66m x 1.83m freestanding mini goal. Galvanised 3.66m x 1.83m freestanding mini goals.